although my mountaineering friends have heaped praises on my abilities as an outdoor chef, i am afraid that neither the magic nor the skill extend far when i am indoors. for such reason, i have surrendered to the inevitable conclusion: that i cannot fight the option to always buy my breakfast and lunch and dinner somewhere. when i began to live alone, one of my first purchases was a teflon pan. i figured that i would do a lot of cooking. i wanted to do a lot of cooking not so much because i had so much confidence in myself as a cook, but because i wanted to save money on food. when i began work at the EU, i spent an average of PhP140 on lunch, and often much more than that for dinner. my meals evolved when i moved to makati, and i would often spend less than PhP15 on breakfast which consisted of a banana, or taho, or a sandwich. but my lunch meals were always too much, and although i could sustain and afford meals priced at more than a hundred pesos, i knew early on that there was no chance i'd manage to save anything substantial if i kept ordering food from RCBC's restaurants. besides, i'd like to treat myself to expensive meals only on rare occasions -- that makes the experience a lot more special. so i attempted cooking. while i have had some measure of success in preparing meals for myself, much of what i purchase monthly goes to waste: either because they haven't been cooked, or because i get sick of eating the same thing at least 3 times in a week. it isn't realistic to cook for 1 person, and it certainly is impractical, but i feel bad about all the food that goes to waste. so although i have a new teflon pot in my small kitchen, i've decided that i can still save even when i don't cook. and to do this, i have to look for places outside of RCBC for my meals. 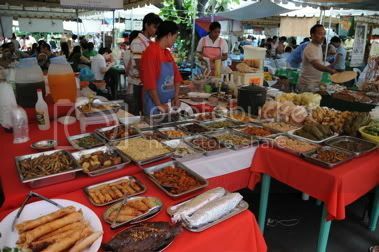 last week, i stocked on food from the salcedo and legazpi community markets. this week, i'm trying out the carinderia just below my building. of course food from those markets aren't that cheap either but they're pretty good, and still a little cheaper than where our lunch meals come from. the food from the turo-turo isn't that bad either, although the choices are always very limited. my pedestrian palate isn't very demanding, so i won't condescend on your standard adobo or menudo. they often do the job, which is to address my hunger, provide me with some nourishment, and keep me away from pork as much as possible. yes, although i hold on to no vegetarian fantasies, as much as i can, i avoid pork, am not necessarily drawn to beef, and would prefer seafood and if there is nothing else, chicken. nonetheless, i think my experiments in the kitchen will continue, though at a significantly reduced rate: i will focus more on pastas and international cuisine (what to do with my vietnamese rice paper and pad thai rice noodles?). i am stocking on herbs and spices, rather than meats and fish. i've purchased several plastic containers, so after i cook, i can just stock them in the refrigerator. 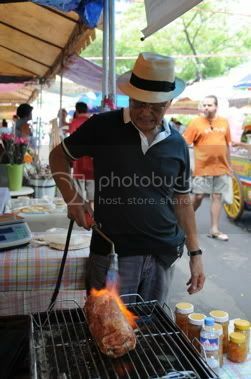 i wonder whether i will find a lunch group in RCBC which allows me to cook and share my meals with strangers. i've heard of something like that somewhere. so anyway, after many several postponements, and owing perhaps to the fact that i am always out of town on weekends, i finally had time to visit the salcedo and legazpi community markets. they're both very interesting, although it's strange why salcedo has more patrons. 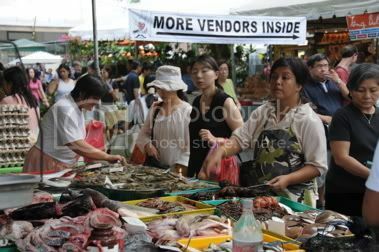 and i must say, i've never seen such a chic crowd at a market. 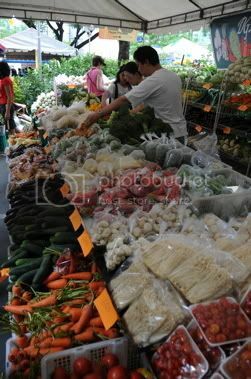 of course, this isn't just any market, since no one shouts, "oy suki! bili ka na! buena mano!" rather, i'd hear "french food! get your french food here!" from a real frenchman. i'd even practiced ordering in french for une galette, s'il vous plaît or in spanish too: quiero un ceviche, por favor. haha. it's very interesting though that each time i've gone (and i've only gone twice to salcedo, meeting fab_ab both times), i always discover something new that i hadn't seen previously. so it only means that i'll keep coming back. and i'd gladly take anyone along. Your neighbor will be glad to cart away your excess culinary masterpieces. When are we heading to Malcolm's Place? 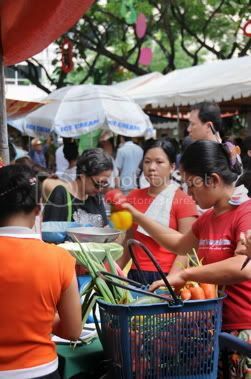 while it's been patterned after european markets, i don't think the salcedo community market can compare to what you have over there andri, :D but it's the closest thing we have to a cool, chic market full of organic goodies. wassup?